Alex Zimmerman is an associate at the law firm of Hull & Zimmerman, specializing in personal injury law and social security disability law. 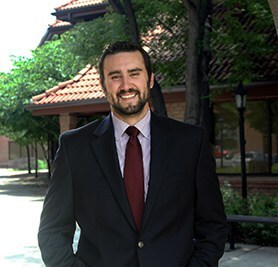 Alex received his bachelor’s degree from the University of Northern Colorado in 2008, and his Juris doctorate from Washburn University School of Law in 2014. While in law school, Alex clerked for the Honorable Barry Grissom at the United States Attorney’s Office for the District of Kansas, and was awarded the Clinical Legal Education Association’s Outstanding Student Award for his representation of criminal defendants suffering mental disabilities. Alex uses his trial advocacy, and litigation skills to zealously advocate for his clients that have been injured as a result of someone else’s negligence, or for his clients seeking benefits from the Social Security Administration. Alex is an active member of the Colorado Bar Association, the Colorado Trial Lawyers Association, as well as the American Association for Justice.